The suit is known for its highly elegant design. The premium quality raw materials used in its crafting renders it high resistance to fading and shrinkage.We have earned a sterling reputation in the industry for manufacturing. Black Colour cotton fabric Patiala suit. 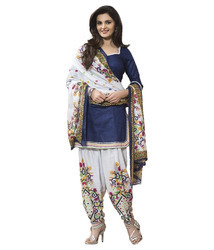 Offering Fashioned Punjabi Suit Patiala, Shahi Suit, Pajami Salwar Suits, Embroidered Suit, Dupatta Punjabi Suits, Phulkari Suit, Fancy Salvar Suit, Punjab Bridal Suit, Kameez Pajama Designer Suits.